We could just have easily called this post "How the CFA L1 fits into the overall CFA Curriculum." That's because the first part of devising an effective study plan is understanding what you're expected to know. Makes sense right? The L1 topic weights are obviously instructive. But its also helpful to contextualize them relative to what else you're going to need to learn to pass all three levels to earn the Charter. Why? Because the CFA Exam makers know that they have three levels to ensure they completely test your knowledge base, and they'll weight L1 more on areas that don't get tested later. So how do we use this to help prepare for L1? As you can see from the different weights across the different exams, each one tends to emphasize a part of that process. 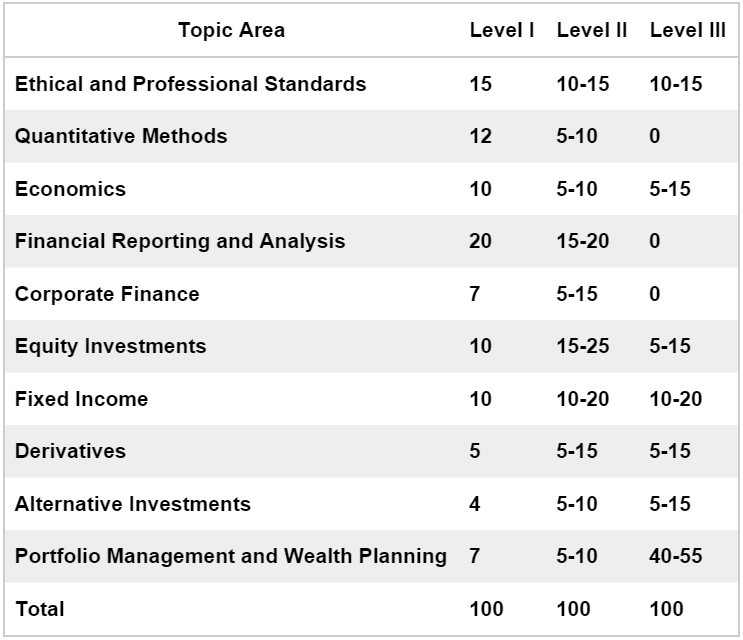 Level 2 goes really deep into evaluating individual asset classes. It's far and away the most in-depth and technical when it comes to evaluating / calculating valuations for fixed income, derivatives, and equities. It also challenges Candidates by embedding problems within longer passages. So you need to know not only how to solve a problem, but what information is relevant and what information you can discard. It's no surprise then that Level 1 is a broad introduction to a lot of this material. You'll need a grasp of the different asset classes and you'll be introduced to different tools and equations to examine each. But you won't go as deep as L2 and you don't need to put concepts together as readily as in L3. Finally, this is testing ground number one to hammer home your ethical responsibilities. A significant portion of the exam drills into the basic building blocks and tools you need for everything else to make sense. ** Without getting too exhaustive (which we do in this complete overview of Level 1), let's go a little deeper on a few of the key areas you need to master. Ethics is one of these fundamental blocks. It is a HUGE component of L1. Yet despite the 15% weighting, many Candidates understimate the section. You see, Ethics questions appear deceptively simple when they actually take a lot of getting used to. You'll have approximately 36 problems dealing with Ethics. Do plenty of practice problems. If 36 problems doesn't convince you, you should always remember that in the event you are on the border of pass and fail, your score in Ethics is used to determine if you should move to Level 2. Quantitative Methods and Economics are also heavily stressed in L1. You need a strong grounding in probability and statistics (including regression analysis) to score well in the quantative methods section. Economics can also be quite challenging if you don't have an academic background in it. This section is often really tedious. It has de-railed many good intentions. If you need to, skim this during your first pass. Financial Reporting and Analysis is the largest section of L1 and it's also one of the most challenging for most Candidates. Not only that, everything you learn here is vital to getting through L2 as well. Note that Financial reporting has a real mix of both conceptual material and calcuation and ratio heavy material that makes it a lengthy section. There's no alternative but to spend a lot of time learning this material (you can start with this overview). Finally, bond and fixed-income basics form a cornerstone of all three levels. You can read about bond basics here. Now that you understand the topic weights, the next question might be: whether to choose third party notes (like ours) and how to structure your studying.